Grapevine cultivation and wine production occur in Greece since antiquity. Modern wineries have focused on the cultivation of international varieties; however, a marked trend to the revival of the local grapevine varieties has been noted in the last two decades underlying the confidence and the intention to invest on the local plant resources aiming to produce unique products. This brings up the urgent necessity to genetically identify the local varieties that constitute the Greek vineyard so as they will be available for further development. Simple-Sequence Repeats (SSRs) molecular markers, including those proposed by the International Organization of Vine and Wine (OIV) as molecular descriptors, have been used to genotype: i) 12 wine producing varieties maintained in the ex-situ ampelographic collection of the Greek Gene Bank (GGB), ii) 30 varieties that have been collected from various sites of northern Greece in order to verify and confirm their identity, and iii) 11 international varieties that have been used as references. 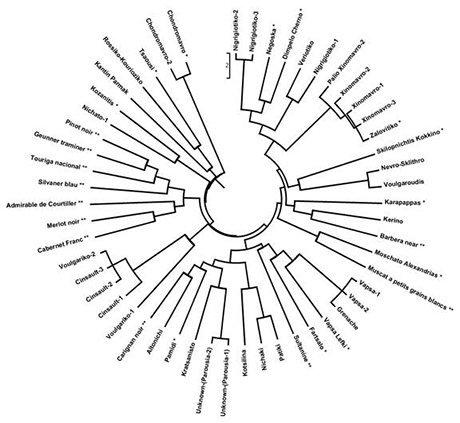 The final dendrogram displays the genetic closeness between the analysed varieties, bringing up cases of synonymies and homonymies. 1Viticulture in northern Greece is dated in the Neolithic era. Recent archaeological activities in northern Greece (Dikili Tash location at Philippi, Macedonia, Greece) unearthed charred pips and skins dated to 2400 BC, thereby establishing the region of eastern Macedonia as the oldest site in Europe for which there are strong indications for wine production and consumption (Valamoti et al., 2007; Valamoti, 2015). The archaeological site is located within the greater Mount Pangaion area, which was one of the earliest places of worship of Dionysus, the ancient Greek god of grapes, winemaking, wine, festivity, and ritual madness (Wikipedia, 2016). In many occasions ancient rituals are still met in modern customs (Visaltis, 2016) demonstrating the continuity of cultural elements through the passing millennia. 2Ismarikos, Maronios, Mendaios, Acanthios, Skionios and Vivlinos were famous wines from the regions of ancient Macedonia and Thrace, whereas the Lemnios, Lesvios, and Thassios wines were from the respective islands of the northern Aegean (Τράιου, 1993). In all these occasions the name of each wine signified its place of origin, which is the forerunner of contemporary VQPRD practice: the wines are identified and marked with geographical names and appellations (Τράιου, 1993). The viticulture in Greece continued both in Byzantine times as well as during the Ottoman occupation (13th- 19th century). Ottoman tax records listed in viticulture and wine production at Kozani district (in 1528) and Thassos island (Καλινδέρη, 1974; Χιόνης, 2016, respectively). Wine from Thassos island was merchandised in Constantinople during the 16th and 17th century (Χιόνης, 2016). Over time wine production became the driving force of viticulture in northern Greece utilizing local grape varieties until the “phylloxera plague” came up early in the 20th century (Νικολάου, 2008) threatening to set an end on the long viticulture tradition. The use of American rootstocks, however, ensured grapevine cultivation. 3During the 20th century, the combination of intensive production systems that prevailed in global agriculture supporting the cultivation of a limited number of improved and highly productive international varieties or hybrids, and also a strategic turn in favour to tourism and urban development rather than agricultural production, resulted in dramatic reduction or even disappearance of a large number of local cultivars from current farming systems (Σαμαράς & Ματθαίου, 2006; Hammer & Teklu, 2008 and references therein). 4In recent years, modern family based wineries have been established aiming to revive local viticulture to the contemporary standards and qualities partly relying on the cultivation of the numerous local varieties. This trend reflects the intention to invest in the plant genetic legacy that represents the long standing wine tradition, aiming to produce innovative products. Local varieties have excellent adaptation to the soil and climatic conditions of the local microenvironment, thus support environmentally friendly, low-input agricultural practices that contribute to the sustainability of natural resources, while they deliver optimum quality results comparable to the international varieties (Σταυρακάκης, 2003). 5In the recent past, studies on morphological and molecular characterization of the local varieties have been performed leading to the development of the Greek Vitis Database (Lefort and Roubelakis, 2001; http://gvd.biology.uoc.gr/​gvd/​). The current study aims to assess genetic diversity of wine producing local varieties of northern Greece. Genetic relationships were assessed by the application of 10 SSR markers, including the six highly polymorphic SSRs molecular markers that have been suggested as molecular descriptors by the OIV (OIV, 2009). The main outcome of this is the construction of a genetic database, which will constitute the comparative framework that can be used to authenticate the local grapevine varieties and contribute to further development of the wine industry, while the use of the OIV set of molecular markers enables comparative studies with international varieties. Moreover, the results could provide knowledge and valuable tools for future breeding activities. 6Young leaves were collected at the beginning of the growing season and were stored at -800C. Later, isolation of genomic DNA was performed using the ‘NucleoSpin Plant II’ kit (Macherey-Nagel, Germany), according to the manufacturer’s instructions. DNA concentration of all isolates was measured using a NanoDrop-1000 (Thermo Scientific, Wilmington, DE, USA) spectrophotometer at 260 and 280 nm ultraviolet lengths, whereas the integrity of all DNA samples was estimated by gel electrophoresis in 0.8 % agarose gels. Samples were then diluted to 20 ng/μl working concentration. 7Polymerase Chain Reactions (PCRs) were performed in a volume of 20 µL including 30 ng genomic DNA, 200 mM dNTPs, 40 pmol primers, 2 μL 10X KAPATaq DNA Polymerase buffer, and 1 U KAPATaq DNA Polymerase (KapaBiosystems, Cape Town, South Africa). The following 10 pairs of primers were used: VVS2, VrZAG62, VrZAG67, VrSZAG79, VVMD5, VVMD7, VVMD27, VVMD28, VVMD32, and VVMD25. Forward primers were 5΄-end fluorescently labeled either with FAM, HEX, ROX or TAMRA. PCR amplifications were performed in a MasterCycler (Eppendorf, Ham­burg, Germany) as follows: an initial step of 5 min at 95°C, followed by 35 cycles, each one including 15 s at 95°C for denaturation, 15 s at 52° to 56°C (depending on the primer) for annealing, and 10 s at 72°C for elongation; a 5 min step at 72°C was programmed as a final extension. PCR fragments were separated using capillary electrophoresis in a 3730xl DNA Analyzer (Applied Biosystems, USA). Data analysis, sizing and genotyping were performed using the GeneMapper (version 4.0) software. The comparative study of the results was performed in the GenAlex platform. Dendrogram was constructed using the MEGA4 program. 8Genotyping of the Greek local varieties is of crucial importance for the Greek wine industry because it will provide the basis of the study of the local varieties backing up their oenological potential and the production of healthy plant material that could be used for the establishment of new vineyards contributing to agricultural development. Further, genotyping the Greek vineyard could be used for authentication or identification of varieties that are currently in cultivation in the country. It is estimated that there are about 300 local Greek varieties. A large number of them, including red, white, table and wine producing varieties, as well as varieties for raisin production, are conserved and evaluated in the ex-situ ampelographic collection of the GGB. Most of these varieties have been described ampelographically (Stanpakas, 2011). 9In the current study, a total of 53 varieties has been analysed with the use of 10 SSRs: samples from 12 varieties were collected from the GGB (indicated with a single asterisk in Table 1 and in Figure 1), 11 were generously donated from Dr Erica Maul of Julius Kühn-Institut (indicated with two asterisks in Table 1 and in Figure 1), whereas the remaining 30 samples were collected from different regions of northern Greece in order to identify them molecularly- designation of the latter ones is based almost exclusively on the empirical ampelographic capability of the donor grapevine grower. 10Varieties with one asterisk (*) are maintained in the GGB (Greek Gene Bank); varieties with two asterisks (**) have been donated from the Julius Kühn-Institut; varieties with no asterisk have been collected from various areas of northern Greece. 11Varieties with one asterisk (*) are maintained in the GGB; varieties with two asterisks (**) have been donated from the Julius Kühn-Institut; varieties with no asterisk have been collected from various areas of northern Greece. Variety ‘Chondromavro’-2, which was collected from western Macedonia, has been grouped in the clade with the variety ‘Chondromavro’ maintained in the GGB. This demonstrates the importance to possess a genetic database that could be used to identify by comparison the varieties possessing high genetic relationship to the varieties maintained in the ampelographic collections. Variety ‘Nevro’ (or ‘Sklithro’) collected from the Pelekanos region of the Kozani district (western Macedonia) has been grouped with the ‘Voulgaroudis’ variety that has been collected from the Soufli area (Thrace), revealing a case of synonymy (various designations attributed to a single genotype). Further analysis with more SSRs is needed in this occasion. A potential case of homonymy (the same designation attributed to different genotypes) was also revealed: ‘Nigrigiotiko’-1 has been grouped in the same clade with ‘Veriotiko’, whereas ‘Nigrigiotiko’-2 and ‘Nigrigiotiko’-3 have been grouped in a different clade. ‘Xinomavro’ related varieties have been grouped in the same clade with ‘Zalovitiko’ confirming the ampelographic closeness between them. Three ‘Cinsault’ samples (‘Cinsault’-1, -2, -3) have been grouped in the same clade with the ‘Voulgariko’-2 variety. Two Unknown varieties from the Parousia Estate (‘Unknown-Parousia’-1 and ‘Unknown-Parousia’-2) that had been collected from the slopes of Mount Pangaion (eastern Macedonia) have been found to be loosely related to the ‘Kratsanisto’ that has been collected from the Livadi area on the western slopes of Mount Olympus (southern parts of central Macedonia). Since ‘Kratsanisto’ is a novel designation, further study is needed. Interestingly, the majority (7/11) of the international varieties that were used as references, have been grouped together in one clade distinctively separated from the Greek local varieties. 13We thank the grapevine growers in northern Greece for donating plant material from their vineyards. We thank Dr Erica Maul of the Julius Kühn-Institut for donating genomic DNAs of international grapevine varieties. We thank Mr Efthimios Mpatianis for his enthusiastic help. This research project is funded under the Action “Research & Technology Development Innovation projects (AgroETAK)”, MIS 453350, in the framework of the Operational Program “Human Resources Development”. It is co-funded by the European Social Fund and by National Resources through the National Strategic Reference Framework 2007-2013 (NSRF 2007-2013) coordinated by the Hellenic Agricultural Organisation "DEMETER" (Institute of Industrial and Forage Plants). 14Καλινδέρη Μ (1974) Ο Κώδιξ της Μητροπόλεως Σισανίου και Σιατίστης, (πράξη 10 του 1686, Σελ. 21 και πράξεις 7,14 του 1688), Θεσσαλονίκη. 15Νικολάου ΝΑ (2008) Αμπελουργία. Εκδόσεις Σύγχρονη Παιδεία, Θεσσαλονίκη. 17Σταυρακάκης ΜΝ (2003) Ποικιλίες και κλώνοι του Ελληνικού αμπελώνα. Γεωργία-Κτηνοτροφία 6: 27-32. 18Σταύρακας ΔΕ (2011) Αμπελογραφία. Εκδ. Ζήτης. 19Τράιου Ε (1993) Aμπελοοινική ιστορία σε Mακεδονία-Θράκη. Εφημερίδα Καθημερινή, Επτά Ημέρες, 17/10/1993. 20Χιόνης Κ (2016) Η Θάσος, η Κωνσταντινούπολη και το Οικουμενικό Πατριαρχείο. Θασιακά, Επιμέλεια Χιόνης Κ, 17ος Τόμος, Σελ. 353-358. 21Lefort F, Roubelakis-Angelakis KA (2001). Genetic comparison of Greek cultivars of Vitis vinifera L. by nuclear microsatellite profiling. American Journal of Enology and Viticulture. 52:101-108. 22Hammer K, Teklu Y (2008) Plant Genetic Resources: Selected issues from genetic erosion to genetic engineering. Journal of Agriculture and Rural Development in the Tropics and Subtropics 109:15–50. 23OIV (Organisation Internationale de la Vigne et du Vin) (2009) 2ND Edition of the OIV descriptor list for grape varieites and Vitis species. http://www.oiv.int/​oiv/​info/​enplubicationoiv#grape. 24Valamoti SM, Mangafa M, Koukouli-Chrysanthaki C, Malamidou D (2007) Grape-pressings from northern Greece: the earliest wine in the Aegean? Antiquity 81: 54–61. 26Visaltis (2016) Παγγαίο- Διονυσιακή λατρεία, γιορτές, μαινάδες. Viewed online 14 November: http://www.visaltis.net/​2015/​03/​blog-post_19.html. Viewed on November 2016.